With 1 April nearly upon us, local authorities, government departments, NHS trusts, clinical commissioning groups and other public sector bodies have been busy planning their budgets and commissioning services for the next financial year. In the context of increasingly limited resources – now more than ever – we need to ensure we gain the greatest value from every pound spent. Since the Public Services (Social Value) Act 2012 came into force, public sector bodies are required to consider economic, social and environmental value when procuring services. When spending money on goods and commissioning services, they must ensure that this investment will also produce a wider benefit to the community – this is called social value. We know that improving the wider determinants of health – those structural factors that affect the quality of our daily lives, such as access to good quality jobs – will help to improve health and reduce health inequalities for communities. This was a key finding of the Marmot Review, which argued that reducing health inequalities requires action across all the social determinants of health – the conditions in which people are born, grow, work, live, and age. 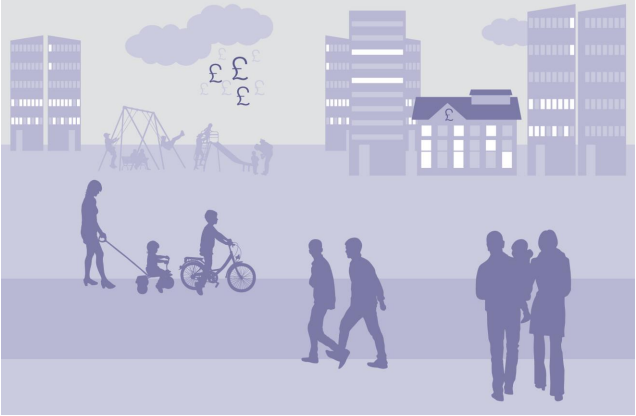 The requirements of the Social Value Act are therefore a really important opportunity for public bodies to think about how to achieve the very best for their communities across a range of outcomes – including health and health inequalities. There is a growing body of guidance to help with applying the Social Value Act, but thinking through the implications of a social value perspective for health and health inequalities is trickier. To address this gap, Public Health England commissioned the Institute of Health Equity to produce a practice resource on social value for local public sector commissioners to help them increase the social value of local services in ways that can help to reduce health inequalities. As well as offering useful tips and suggestions, the resource shares some great examples of local organisations that are already ahead of the curve when it comes to social value. For example, Liverpool Clinical Commissioning Group has developed a social value framework that sets out objectives, ambitions, performance measures and metrics for each of the three social value domains – economic, social and environmental wellbeing. Social value commitments including living wage are being included as part of contracts within the nine main NHS provider trusts in Liverpool for 2015-16, and the CCG is working with a large range of voluntary and community organisations on new approaches to engaging diverse communities in health care planning. The Sustainable Development Unit, funded by NHS England and Public Health England, has also produced a module on creating social value. Focusing on social value has huge potential for improving health and reducing inequalities in our communities by addressing many of the recommendations of the Marmot Review. For example, employing local residents and improving the terms and conditions of employment can contribute to creating fair employment and good work for all. Making environmental improvements and addressing anti-social behaviour helps to create healthy and sustainable places and communities, while supporting older people to live independently and investing in health and social care schemes can strengthen the role and impact of ill-health prevention. An NHS trust could commission a service from a social enterprise that hires local, unemployed young people, trains them and pays them a living wage. This creates a social value that goes well beyond the value of the service being delivered – benefitting the local economy, the individuals who are employed and their families. As well as producing benefits for local communities, there are also advantages for local authorities in embedding social value within the commissioning process. For example, 52% of housing associations and local authorities have reported that including social value in commissioning led to local cost savings for their own organisation. Increasing social value also has the potential to reduce demand on health services (and other services) in the longer term by improving the health and wellbeing of the population. Of course, there may be challenges to implementing a social value approach, such as difficulty in defining social value, a lack of capacity, issues for providers in delivering and demonstrating social value and uncertainty as to how to monitor and measure progress. Developing and integrating a clear measurement system to ensure social value improvements are demonstrated and monitored. And of course, what works for one area might not work for another. Involving a wider range of stakeholders, including internal staff and representatives from local partners, is essential to creating real social value for both local authorities and their communities. Crush the can or just kick it down the road?